In 1998, VocalEssence and the American Composers Forum joined forces to offer an annual contest encouraging the composition of new carols. Over the years hundreds of worthy carols have been submitted. 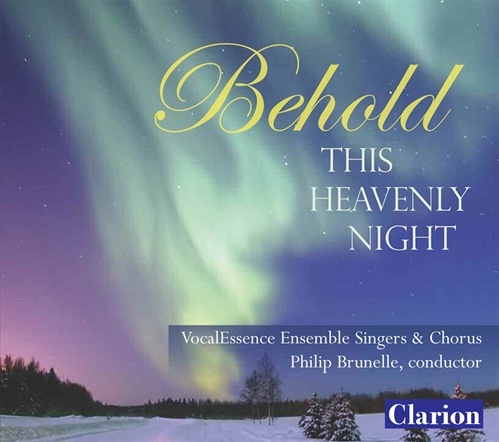 “Behold This Heavenly Night” presents the world premiere of some of these contest-winning carols alongside outstanding arrangements of more familiar melodies. Also included is the U.S. premiere of John Rutter’s new “Carol of the Magi” and a unique arrangement of “Rudolph, the Red-Nosed Reindeer” translated into Latin by Philip Brunelle and his son Christopher. I am especially taken with Paul Lohman’s gentle, sweet ‘What Child’, Matthew Brown’s aptly titled ‘Sweet was the Song’, and Daniel Kantor’s ‘Night of Silence’, which superimposes an attractive new melody atop Franz Gruber’s perennial favorite. As far as I am concerned, Alan Higbee’s hushed and innocent ‘Bleak Midwinter’ dwarfs the better known tune, which has never been one of my favorites. Malcolm Williamson’s arrangement of ‘Ding Dong! Merrily on High’ and J. David Moore’s feisty take on ‘Jingle Bells’ supply the fun. The rest of the way (save for a silly ‘Rudolf the Red-Nosed Reindeer’ delivered in Latin), we get a hushed, deeply felt exposition of the heart and soul of Christmas.